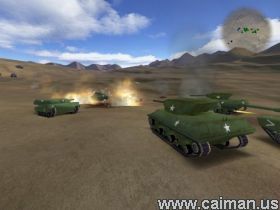 Caiman free games: BattleTanks II by John Judnich. Sometimes you run across a game that just makes you say "Wow". Battle Tanks II is one of these. The effects, graphics, sound scheme, fluidity of gameplay, and design of this game is simply astounding. On the main menu, you choose whether to play a quick game (no setup options) or a normal game where you can choose the landscape, difficulty, aiming method, game stlye, etc. You can also head over to the extensive Options menu to adjust the effects level, sound/music volume, and more. In the game itself you find stunning physics and effects at incredible speeds. About 90% of the games submitted for the Easter contest ran somewhat slow on my computer at least once but this game is non-stop smooth. Flack, explosions, splashes, rubble, craters, and 20+ enemies all run like there was nothing to it. Not only are the effects and speed of this game of the same caliber as the legendary Star Wraith series but also the controls. 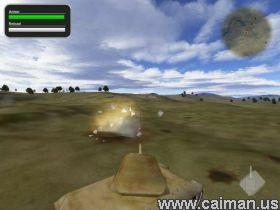 Besides being able to choose which force to be and which of three types of tanks you will operate you can also give 10 different commands to your forces which will automatically carry out your order as you attempt to wipe out the enemy forces. Overall, this is the most professional game I've seen in the entire competition and perhaps, ever in an amateur setting.